This is Part 2 of my Three Part exposition of how the standard New Keynesian approach to the specification of fiscal rules will generate poor advice for politicians desiring to achieve progressive socio-economic goals. The paper I am using to represent the New Keynesian approach has, by all indications, been somewhat influential in the formation of the macroeconomic approach currently being espoused by the British Labour Party. In that sense, the critique aims to disabuse the Labour politicians and their apparatchiks of building policy options based on fake economic knowledge, and, instead, embrace the principles of Modern Monetary Theory (MMT), which provides an accurate depiction of how the monetary system actually operates and the policy options for a currency-issuing government such as in Britain, and the likely consequences of deploying these options. The one major lesson that comes out is that the New Keynesian approach is an elaborate fraud. It plays around with so-called ‘optimising’ models asserting human behaviour that no other social scientist believes remotely captures the essence of human decision-making, and then derives conclusions from these models that are claimed to apply to the world we live in. Prior to the GFC, these ‘models’ didn’t even consider the financial sector. The fact is that nothing of value in terms of specifying what a government should do can be gleaned from a New Keynesian approach. It is barren. In Part 1, we noted that one discussion paper that seems to have influenced the Shadow British Chancellor was published on May 20, 2014 as Discussion Paper No. 429 from the National Institute of Economic and Social Research. The NIESR paper – Issues in the Design of Fiscal Policy Rules – was written by Jonathan Portes (who at the time of writing was the Director of the NIESR before he was ‘let go’) and an Oxford academic, Simon Wren-Lewis. In the second-part of the discussion, I begin by examining the way that the authors try to use the New Keynesian theory as an authority for specific policy conclusions, which they essentially admit (not in those words) cannot, in fact, be derived from the ‘optimal’ theory. … that the government must satisfy its budget constraint (there is no default), and we ignore financing through printing money. It is interesting that in defending the New Keynesian position against say Modern Monetary Theory (MMT), proponents make a claim for superiority based on their mathematical reasoning and the apparent absence of such optimising mathematics in MMT. When useful, MMT uses formal language (mathematics) sparingly. Mostly, propositions can be established without resort to mathematics, which avoids creating a wall of comprehension that most people cannot break down. Further, there is nothing sophisticated about the mathematics that New Keynesians use. It is just simple calculus really, the sort that I learned as an undergraduate studying mathematics. Hard-core mathematicians laugh at the way economists deploy these tools and parade them as if they are generating something deep and meaningful. Note that while the imposition of taxes is deemed a “cost” by Portes and SWL (discussed in Part 1), their ‘model’ doesn’t allow the interest payments on the debt to be a ‘benefit’. They are silent on that. Conveniently so. Anyway, the equation they write out which captures the constrained optimisation process is claimed to be an ex ante financial constraint, akin to the financial constraints facing a household that must earn income, borrow, reduce savings or sell assets in order to spend. As we know, the ‘household budget analogy’ applied to a currency-issuing government is wrong at the most elemental level. Nothing relating to the experience of a household (the currency user) is relevant to assessing the capacities of or the choices available to such a government (currency issuer). Further, why do they ignore “financing through printing money”? Not that “printing money” is a term that could be associated with the real world practice of government spending anyway. They ignore it because it would not allow them to generate the results they desire. The reality is that these so-called ‘budget constraints’ do not depict real ex ante financial constraints. They are, at best, ex post accounting statements, meaning they have to add up. There is nothing much more about them than that. They may also reflect current institutional practice which is a political rather than an intrinsic financial artifact. But, if the authors were to be stock-flow (accounting) consistent (which most mainstream models are not – meaning they deliberately leave things out and that flows do not accumulate properly into the corresponding stocks), then they would ave to include the change in bank reserves arising from central bank monetary operations associated with fiscal policy (for example, crediting banks accounts on behalf of the government). But those operations are absent in their approach, which means their analysis is incomplete in an accounting sense. Conveniently so. Of course, one of the glaring omissions of the New Keynesian models that people learned about after the GFC was that they didn’t even have a financial sector embedded in their basic structure. But that is also another story again. … if for a period government spending has to be unusually high (classically a war, but also perhaps because of a recession or natural disaster), it would be wrong to try and match this higher spending with higher tax rates. Instead taxes should only be raised by a small amount, with debt increasing instead, but taxes should stay high after government spending has come back down, to at least pay the interest on the extra debt and perhaps also to bring debt back down again. 1. Taxes are necessary to fund government spending but temporary deficits (to cope with wars or deep recessions) should be funded by debt. 2. When economic activity improves, there should be a primary fiscal surplus (“taxes … at least pay the interest on the extra debt”) and spending should be cut to allow that outcome. 3. Public debt should be a target policy variable (the lower the better) but in the short-term is a “shock absorber … to avoid sharp movements in taxes or government spending”. 4. This is a ‘deficit dove’ construction. We will have austerity but it will be delayed. The questions one need to ask is under what conditions would a primary surplus be a responsible state for a government to achieve? Portes and SWL want the primary surpluses to be a target goal for government. But such a target is unlikely to be a desirable state. Remember, a primary fiscal balance is the difference between government spending and taxation flows less payments on outstanding public debt. One could imagine a situation where a government would sensibly run a primary surplus or even an overall fiscal surplus (inclusive of interest payments on public debt) if it was accompanied by a robust external surplus, which was pumping net spending in the economy and financing the desire of the private domestic sector to save overall. Then a fiscal surplus would be required to prevent inflationary pressures from emerging. But it would also be consistent with full employment, the provision of first-class public services, and the fulfillment of the overall saving desires by the private domestic sector. Think Norway. That is not remotely descriptive of where the UK (or most nearly all nations) are at or have been at in recent decades. The absurdity of the reasoning that arises from the sort of economic framework that Portes and SWL deploy is illustrated when they start tinkering with the parameters of the ‘model’ to see what transpires. The exercise is trivial. The model has some equations with parameters that link the variables that describe the equation structures. The parameters are conceptual but to get certain results one has to make assumptions about their values (at the most basic level whether they are positive or negative or above or below unity, etc). Then one muses about what specific assumptions imply for the results. … gradually fall … to zero. How can this happen, given that the government has spending to finance? The answer is that debt gradually declines to zero, and then the government starts to build up assets. Eventually it has enough assets that it can finance all its spending from the interest on those assets, and so taxes can be completely eliminated. Which then raises the question of how the government gets access to any of the real resources that are available for productive use in the society. If taxes are zero, why would people offer their labour (and other resources) for the public use? And, how will government make non-inflationary real resource space in order for them to spend (command real resources from the non-government sector)? But discussing those issues will take us away from the main focus. In essence, none of their mathematical ‘cases’ (the scenarios they defined with differing parameter values) can be established in reality. This is a common problem of this sort of economic reasoning. What happens next? They ditch the ‘optimal’ results derived from the calculus and start making stuff up – asserting their ‘priors’. So as not to spoil their story, the authors just assert that “there are two reasons for believing that policy should aim to steadily reduce debt in normal times” even if the ‘optimal’ condition indicates the opposite. First, they introduce the standard argument that “shocks may be asymmetric” with “large negative shock”(s) not being offset in the other direction. This is a sort of ‘war chest’ argument. That a government will not be able to respond fully in a major downturn if it starts with high levels of public debt. Why? It will not be attractive to bond investors, it will run out of money, etc. … large negative shocks like a financial crisis might mean that we enter a liquidity trap, so that fiscal expansion is required to assist monetary policy, while large positive shocks could be dealt with by monetary rather than fiscal contraction. There is no equivalent upper bound for interest rates, so prudent policy would reduce debt in normal times to make room for the liquidity trap possibility. This is the standard mainstream claim that monetary policy is the more effective counter-stabilising (and preferred) policy, except in a deep recession when interest rates are cut to zero and have no further room to fall. So to counter that ineffectiveness when rates are zero, fiscal policy has to be used. But, in general, monetary policy should be prioritised. But then the same assertion follows. So that fiscal policy can be on standby for those times when interest rates are zero, the government should have low levels of outstanding debt. Why? The same argument. It will not be able to fund a new fiscal stimulus if it hasn’t eliminated the impacts from a previous stimulus exercise. That is a plain lie. The authors just assert that the capacity of a government to net spend is inversely related to the current stock of outstanding debt. Why? No reason can be derived from their ‘optimal’ models to justify that assertion. And, again, tell that to Japan! The post-GFC period has demonstrated that ‘monetary policy’ is not a very effective counter-stabilising tool. Governments that used fiscal policy aggressively in the GFC resumed growth much more quickly than those that didn’t. The stimulatory effects of monetary policy are, at best, ambiguous. Further, the truth is that the capacity of the government to spend is in no way constrained by its past fiscal stance – whether it be surplus, balance or deficit. A surplus today does not mean that the government is better placed to run a deficit tomorrow. It can always run a deficit if the non-government spending and saving decisions push it that way. The same goes for outstanding debt, which under current institutional arrangements, will be influenced by the shifts in the flows that make up fiscal policy. But the level of debt doesn’t constrain or alter the government’s ability to net spend. The authors might claim that bond markets will rebel and stop funding the deficits. Even if the recipients of this corporate welfare decided to cut off their noses to spite their faces and stopped buying the debt that would not alter the government’s capacity to spend. First, if it persisted in the unnecessary practice of issuing debt, it could instruct the central bank to set the yield and buy all the debt that the private bond markets didn’t want at that (low to zero) yield. Including all of it! In other words, the government can always play the private bond markets out of the game if it chooses. Even in the Eurozone, where the Member States are not sovereign, the ECB has demonstrated it can set yields at whatever level it chooses. It can drive yields on long-term public debt into the negative! Who would have thought? No New Keynesian that is for sure. They think deficits ‘crowd out’ private investment spending via higher rates (see below). Second, the government can also alter a rule or two or change legislation that embodies these voluntary accounting constraints that I noted in Part 1. That is the right of the legislature and beyond the power of bond markets! … there is an additional reason why it might be desirable to eliminate government debt completely, and that is because it crowds out productive capital. In simple overlapping generation models, agents save to fund their retirement, and this determines the size of the capital stock. If agents have an alternative means of saving, which is to invest in government debt, then this debt displaces productive capital. Again, the authors are just rehearsing the standard and deeply flawed mainstream macroeconomic theory, which has the loanable funds model of financial markets embedded. According to this specious approach, savings are finite and investment competes for the scarce resources. The ‘interest rate’ on loans then brings the two into balance. The logic then says if there is a shift in the investment demand outwards (capturing in this instance the entry of the government bond to compete with corporate bonds), then the interest rate has to rise to ration off the higher demand for loans, given the finite supply (savings). Wrong at the most elemental level. First, savings are not finite. They rise with income and if net public spending increases (rising deficit) then national income will rise and so will saving. Second, and more importantly, real world banks do not remotely operate in a loanable funds way. They will generally extend loans to creditworthy borrowers. This lending is not reserve constrained. Banks do no wait around for depositors to drop their cash off, which they can then on lend. Loans create deposits (liquidity). Not the other way around, as is assumed by the ‘crowding out’ argument which these authors introduce to their analysis. So even if the government is selling debt to the non-government sector, the banks still have the capacity (under our current system) to increase private investment. Further, there is the standard ideological assertion that public spending is ‘less efficient’ (unproductive) compared to “productive capital” (private investment). The research evidence doesn’t support that assertion. It is just a made up claim to justify privatisation and cuts to government activities. It has been used to justify the handing out of millions of dollars of public funds to investment bankers, lawyers, accountants etc to sell off public assets at well below market prices to grasping private investors. We have a long record now of how disastrous most of these sell-offs have been from the perspective of the quality, scope and affordability of services that were previously provided by the state. The next furphy that Portes and SWL introduce is the intergenerational equity argument – aka government debt imposes burdens on our grand kids claim. Again, this conclusion follows their assumption that taxes pay back the debt so deficits today force future generations to incur higher costs. Refer to the previous discussion of the actual role of taxes in a fiat monetary system. The reality is that each generation chooses its own tax and public spending profile via the political process. The way in which intergenerational inequities occur is via real resource utilisation. We can kill the planet and the kids will then miss out. Alternatively, we can ensure the kids get access to first-class public infrastructure (education, health, recreation, etc) and have jobs to go to when they develop their skills and knowledge. Then the kids benefit from today’s fiscal deficits. In other words, the mathematical reasoning leads to nothing definitive so we will just assert things anyway. It helps economists like this gain promotion as academics and other status that they might enjoy – such as picking up ‘Inside Job’ type commissions and misrepresenting ideological reports as independent research. Please read my blog – Universities should operate in an ethical and socially responsible manner – for more discussion on this point. I make that comment generally rather than specifically about the authors (Portes and SWL) in question. I don’t know what they do on the side. So, after all that, what have Portes and SWL to fall back on? Not much. Assertion based on false assumptions. That doesn’t stop them though. – broadly stable tax rates and recurrent government consumption. Noting it doesn’t follow at all from any results about “welfare-maximising” behaviour that they present. The simple optimising model presented, by the authors’ own admission, is “undeveloped” and incapable of any definitive result. The results that they claim were derived from the “previous section” are assertions. But their point is clear. They claim that OECD governments (in general) have not followed these rules and instead the public debt ratios have “steadily increased since the 1970s”, which is evidence of what they call “deficit bias”. Their claim then is that for various reasons, governments have been acting contrary to “welfare-maximising” behaviour – meaning they are acting badly. Simple isn’t it. Make up a benchmark using flawed assumptions that you know does not apply in the real world. Then label any departures from that fantasy world ‘bad’ and QED, you can then claim in the ‘real world’ that the government is behaving badly. However, one can contest the benchmark. If public debt is such an issue, why is the 10-year bond yield for Japanese government bonds at 0.058 per cent (at the time of writing) and why did ‘investors’ pay the Japanese government for the privilege of buying that debt (negative yields) at certain times last year? Moreover, why are ‘investors’ agreeing to negative yields on all government bond maturities from 1-Year to 8-Years at present. Further, back in the 1990s, the financial commentators and mainstream macroeconomists were claiming the outstanding Japanese government debt was the mother of all ticking time bombs and they have used this scare tactic long and hard for decades across all nations. I recall reading some commentator claiming long ago Japan was facing the “mother of all debt-bunnies”, whatever that meant. I guess the ‘bunnies’ hopped away somewhere. I have gone back through the records I keep and found regular references over the last 27 years to the impending insolvency of Japan because it is violating the economists’ notion of welfare-maximising’ debt behaviour. 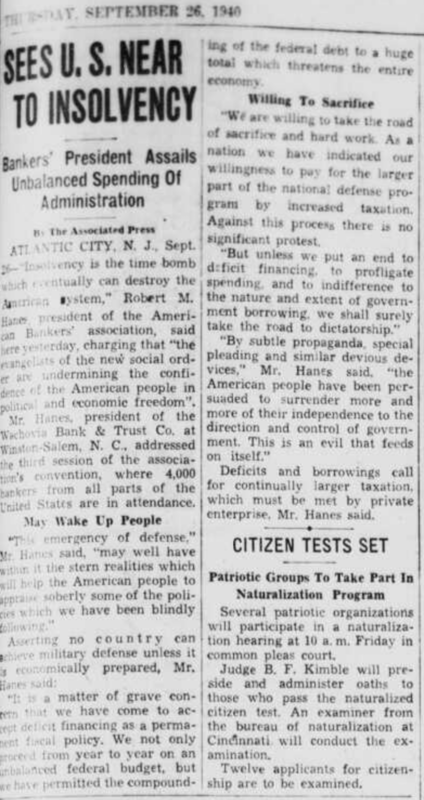 Across the Pacific, the US was apparently “near to insolvency” on Thursday, September 26, 1940. Here is an Associated Press story from The Portsmouth Times (Ohio), which was headlines in the New York Times on the same day. … unless we put an end to deficit financing, to profligate spending, and to indifference to the nature and extent of government borrowing, we shall surely take the road to dictatorship. By subtle propaganda, special pleading and similar devious device … The American people are being persuaded to surrender more and more of their independence to the direction and control of government. This is an evil of feeds on itself. Deficits and borrowings call for continually larger taxation, which must be met by private enterprise. We can find similar remarks throughout history. And, yet, nothing happens. I guess you can cut the Americans some slack such is their penchant for OTT way of doing things. The point is these economic models that claim public debt should be minimised to prevent costly tax burdens are pie-in-the-neoliberal-sky sort of stuff. Further, higher public debt to GDP ratios means that the non-government sector has more risk free debt as a proportion of GDP than previously and corresponding income flows. In Part 3, we will finish the discussion by focusing on topics such as the need for fiscal councils. As you might expect, Portes and SWL are keen on them. They think they will “discipline” these rogue governments who just want to trash the future of our children. What would the Martians think of us if they ever read this sort of stuff? Which means less consumption funded by lending. The bankers seem to get this when they fight against deficit spending. What should be the process by which a currency-issuing government decides that full employment exists and inflationary pressures are emerging and discretionary government spending needs to be cut? SW-L and Portes claim, as Bill points out, that come a recession, the state should fund the extra spending needed to deal with the recession via extra borrowing. Completely barmy: borrowing has a DEFLATIONARY effect which is the opposite of the desired effect, i.e. stimulus. It’s as fatuous as throwing dirt over your car before washing it. (Though it should be said that SW-L and Portes are not the only ones to make that claim). One popular argument for borrowing rather than simply printing money is that borrowing is easier to reverse, should the need arise. The reasoning there being that sudden rises in tax can be politically difficult, whereas having the central bank sell some of its stock of government debt is less politically problematic. Well the answer to that is that even if the central bank has no government debt, there is nothing to stop it wading into the market and offering to borrow at above the going rate. And if that’s not allowed by the law, the law can easily be changed. The latter point adds support to the claim made by Warren Mosler and Milton Friedman namely that there should ideally be no government debt. I.e. the state should pay no interest on its liabilities – though (to repeat) paying interest for a short while would be justified I think given the need for sudden “reversal”. Suppose that the Labour party were to adopt someone like you as its chief economic adviser and wholeheartedly embrace MMT. What would be the electoral consequences of these changes given that the vast majority of voters believe that government finances and household finances are analogous? It is quite possible that by embracing MMT the Labour party would insure its defeat. On the other hand, most Labor parties in Europe have declined dramatically despite studious avoidance of anything smacking of MMT. You are on fire ! This 3 part series needs to made into a PDF. Like Warren’s innocent frauds. Then given to Momentum and Labour party members. I will be sharing it with the SNP and the Common Weal Project. Who share similar views as SWL and Portes. …So Labour will have to ditch the (stupid) rule (which they should never have adopted anyway). Bill, have you ever approached, or, if not, would you ever consider approaching, Shadow Chancellor John McDonnell directly on these matters? It’s getting to the point where some heavyweight MMT proponents are urgently needed to support the front line of opposition economic policy in the UK, because, by the sound of your blog, the current crop of advisors is sorely lacking – damaging, even. The phrase “government debt” is the conventional description of what the U.S. government does when it sells Treasury securities. It’s a misnomer. Operationally, it is the accumulation of savings. What would it take to substitute the latter for the phrase “government debt” in the discussion of fiscal and monetary operations for a monetarily sovereign nation? Also, made obsolete by the fiat standard; Federal revenue, funded by Federal taxpayers, paid from Trust Fund Accounts, and I’m sure there are others. The Job Guarantee ensures there is always full employment. You then set discretionary policy so that the Job Guarantee buffer never exhausts in any physical location within the country. Once you have a Job Guarantee you don’t care too much if businesses go bust, so you make sure businesses that put their prices up go bust. I’m trying to reconcile this in real terms. From a household perspective, I think of spending money as consumption of real capital and saving money as accumulation of real capital. When I think of government spending, I still think of real capital consumption. If such a case, increasing levels of government spending would result in a decreasing real capital base. In this quote, however, you’re saying that government spending raises savings, which I assume you mean in both nominal and real terms. Is no government spending equivalent to consumption? Is it possible for increasing government deficits to result in increasing monetary saving (net financial assets) but for the accumulation of real capital goods to diminish? So the failure of ToysRUs and Maplin will cause inflation will it. Try telling that to the 5500 who have lost their job. Let’s hope they can be quickly engaged elsewhere in their locality – something that wouldn’t be an issue with a job guarantee. What a silly statement. Capital reallocation happens all the time in a capitalist society. There’s nothing magical about exchanging things abroad rather than at home. You’d have to be a real monoculturist to believe otherwise. Why? Does Tesco refuse to fix its roof if it receives spending from nurses rather than bankers? Sadly MMT has yet to go mainstream. Politics is the art of the possible. Isn’t it more likely that Labour is listening to this stuff because they think they can sell it to the electorate? Neil – I’m not saying that as a statement. I’m asking it. Is there any portion of government spending that represents consumption of real capital? In your example, are the nurses consuming more than they otherwise would as a result of some type of government spending? Is there a dichotomy between monetary saving and real capital accumulation? The disconnect between reality and these notions are staggering. and why did ‘investors’ pay the Japanese government for the privilege of buying that debt (negative yields) at certain times last year? As a matter of interest, why did ‘investors’ pay the Japanese government for the privilege of buying that debt (negative yields) at certain times last year? I’ve pondered this same question and the only answer I can come up with is they have no understanding of the monetary system and don’t understand the difference between nominal and real rates. I presume it’s because it’s safer to pay a little for the privilege of holding some of your assets so securely. Bank deposits are are only guaranteed to something equivalent to the £80k I recall it is in the UK. All other assets have more risks and may not be so readily convertible into other assets or bank reserves, I think they can also be important for shadow banking though I’m afraid I don’t understand it enough to explain. You make money on negative Japanese government bonds by swapping dollars for yen, buying government bonds with the yen, and still make more dollars on the tail end of the swap than you spend on negative bond interest. The real money is in the cross-currency basis swap. It shouldn’t happen according to economic textbooks because of assumptions of no arbitrage. But arbitrage has persisted in currency swap markets for a decade, so you can make money on negative interest by combining it with currency swaps. Many thanks for your explanations @Xenji, @John, & @Robert. DZ, One person’s spending is another person’s income. Increased govt spending provides more income to the private sector, which increases their consumption & savings. DZ:Is no government spending equivalent to consumption? Is it possible for increasing government deficits to result in increasing monetary saving (net financial assets) but for the accumulation of real capital goods to diminish? Yes, of course it is possible, but in rich countries these days, you have to work ever harder for it. The basic example is military spending, especially military spending on a losing war. But even that doesn’t always work, unless it is fought on your own territory and your own real capital gets destroyed. Another example that may be realer but harder to quantify is spending on worthless things that destroy the physical environment or use up irreplaceable resources. It would be more accurate to say, analogous to what Einstein said of the universe, that savings are finite but unbounded. Savings are never actually infinite. Further to Simon Wren-Lewis’ intergenerational theme: I understand the nonsense about having to pay back bonds in the future. But – assuming all bonds have been replaced with say Federal Reserve Deposits, and say the govt has spent 40 years maintaining Full Employment with a Job Gty, and it used fiscal policy to maintain inflation at a reasonably low level, but nevertheless over say 40 years it accumulated a mountain of Reserve Deposits held by the folk. The holders of those deposits have a claim on ownership of the nation’s capital base and/or its output. Fine, but at some point the holders start to buy up the assets and more importantly the output. A new worker turning 21 starts working for a piece of the pie now has some major competition for the output. So it has to share the economy’s output with the deposit holders. So it pays through higher prices. Is this not an intergenerational transfer? A claim on output sold to the holders 3 generations ago? And what if the holders were foreign entities? (not that it should matte that much.) Should we shed tears for the poor, poor grandkids?